(London’s Daily Telegraph) – It was installed this week outside a butcher’s shop in the fashionable 11th arrondissement (administrative district). A 250-gram faux-filet of beef costs €8.50 ($9.70), while two pork chops are priced at €5 ($5.70). The machine, which accepts cash or credit cards, also stocks beef carpaccio, Bayonne ham from the Basque country, chicken and eggs. The introduction of the meat dispenser is in line with a trend to make fresh produce available 24 hours a day, despite strict laws governing Sunday opening and the reluctance of many shops to open seven days a week. Paris got its first 24-hour baguette vending machine in 2011 when a baker installed one next to his boulangerie. Since then, hundreds more have been installed across the country. The refrigerated meat machine costs nearly €10,000 ($11,406), roughly the same as a bread dispenser, which maintains baguettes at an ideal temperature of 59F to 68F, with humidity of 50 to 60 per cent. It is France’s fifth meat vending machine. The other four are located in the provinces. A delicatessen in the central town of Mennetou-sur-Cher installed one last month that sells andouillette, a strongly-flavoured sausage made with pig’s intestines. The first French butcher to install a meat vending machine, in the south-western town of Sainte-Catherine two years ago, said the idea came from Germany. “There are about 500 meat vending machines there,” Laëtitia Lafaye said. Last year a cheesemonger in the eastern town of Pontarlier installed an automatic cheese distributor. But the spread of food vending machines is proving controversial. Traditionalists say they will lead to the demise of craft butchers, bakers and cheese shops. However, many people welcome the machines as a convenient source of fresh produce. 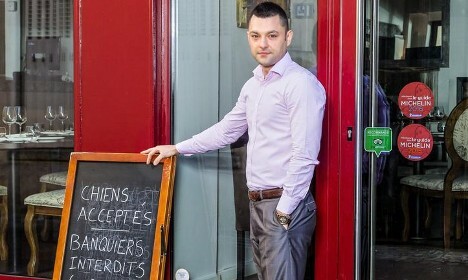 (London’s Daily Telegraph) – The owner of a highly rated restaurant outside Paris has banned bankers from his eatery in revenge for being denied a loan. Alexandre Callet, 30, who runs the gourmet restaurant Les Ecuries de Richelieu, is furious with financiers after he was refused a €70,000 ($79,842) credit line to open a second venue. “As soon as I see a banker that I recognize I won’t let them enter my restaurant. They have treated me like a dog, so I have denied them access,” he said. “I’m not going to police the doors but the people concerned know who they are,” he told Le Figaro. His move has struck a nerve among many entrepreneurial Frenchmen and women who feel stifled by a lack of financial support from the banking sector. “Restaurateurs, entrepreneurs, we’re all in the same boat…” Mr Callet said. He described his act as one of desperation at the “permanent sabotage of the economic fabric of France,” whose growth is near-stagnant and unemployment rate at record levels. Mr Callet said he felt “humiliated” as the size of the loan was very reasonable given his turnover for last year of €300,000 ($342,182) – his best ever and triple that of his first year in 2008. “I have never had financial problems and yet I find myself in this situation. Bankers are not doing their job. That’s why we have so many businesses in France who have to resort to crowd funding. “France has problems understanding this. That’s why London has become the sixth French city,” he said. “It’s the problem with our French Socialism. We have more civil servants than anywhere in the world, we have a social welfare system that has a bigger budget than the American defence budget. The restaurateur said he had already received a personal apology from one bank director. “He came to the restaurant this morning and was visibly very put out,” he said. He was also contacted by Qatar’s embassy in Paris, which offered to put him in contact with a Qatari bank.